Some of the coolest things you’ll see at Comic-Con are the Lego built characters either at their booth, other booths, and even outside of the convention center itself. This year if you happen to make it to the Warner Bros. booth (#4545) you will get to see a Lego Smaug standing over six feet tall and weighing 411 pounds. Smaug took 625 hours to complete and includes 83,433 pieces. The folks at Lego also have some surprises for fans showing off new sets for The Hobbit: The Battle of the Five Armies as well as an exclusive Bard figure. In anticipation of this December’s theatrical release of THE HOBBIT: The Battle of the Five Armies, a production of New Line Cinema and Metro-Goldwyn-Mayer Pictures (MGM), LEGO Systems will unveil one of the new LEGO THE HOBBIT sets that is slated to hit store shelves in October. 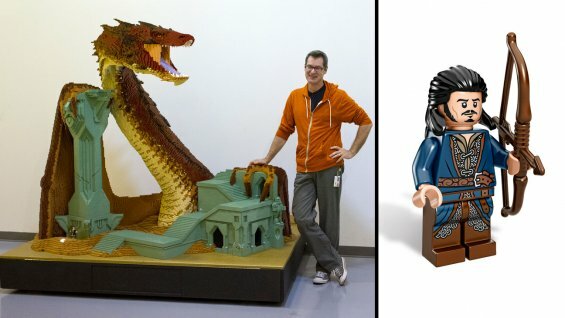 A large-scale model of Smaug, built entirely from LEGO bricks and featuring custom light features to simulate the dragon’s fire-breathing ability, will be displayed in the Warner Bros. booth #4545. On Thursday, July 24, fans will also have a chance to win a LEGO THE HOBBIT minifigure.